She has been in love with dance since she was an early teen, fortunate to take a few years of tap, jazz, and ballet before heading more towards physical fitness in high school. Although she was active for her younger years, after having children and throughout her adult life Lizy found herself struggling with her weight. By 45 she found herself at her heaviest at 240 lbs suffering from high blood pressure, type 2 diabetes and other physical complaints that came along with carrying around that much weight. Lizy was stuck, she knew it, but didn’t know how to change it. At 45 Lizy and her husband Rob were offered the opportunity of a lifetime when they entered a Couples Makeover Contest on The Ocean 98.5 FM and had the support of friends, family and an overwhelming response from the community and they won! They began the Fit Life Program and through group fitness got moving and changed their eating habits. In 6 months she reversed diabetes, high blood pressure, lost nearly 40 lbs and converted 35 lbs of fat to muscle and went from a size 22 to a size 14. At the end of the 6-month program, Lizy joined the Victoria YMCA and joined the Cardio Party Dance class and was brought back to her younger years. It wasn’t until her instructor Bonnie went away on vacation in August 2012 and a Zumba® class was substituted that she had ever enjoyed a Zumba class before. It was the following week that her instructor and inspiration Cindy Haverland taught and Lizy fell in love! She took 9 classes in 3 weeks by Cindy and Lizy knew she found her passion. “Working out” wasn’t working out for Lizy, but Zumba® ignited her! After maintaining her weight for 6 months, Lizy started watching the weight drop off and her body start changing. It took three days to decide and tell her amazing and supportive husband Rob that it was her dream to be a Zumba Fitness® Instructor and the training was a month away and he told her to GO FOR IT! In fact, everyone was so supportive and great about it, that it was just the right path to be taking. And Nov 16, 2012, Lizy went to Vancouver and took her Basic Level 1 Zumba Fitness® training and came home exhausted with a license in her hand and a lot of practice ahead of her. Everywhere became somewhere to practice. She practiced at the computer shop after it closed and on the weekend. The kitchen has a tv and is a favourite spot for watching new choreography. She rented 3 hours a week at Bashirah Middle Eastern Dance Studio after Cindy’s class at the Y and danced into the night, rehearsing what she knew and learning what she didn’t. Then she learned about accessing the Y when no classes were scheduled in studios so all of a sudden there was LOT of time to rehearse, and that is what she did. She had to be ready to teach for Rob’s mom Jan 10! Lizy kept teaching weekly classes and averaging about 20 hours a week of classes and practice. In the beginning of February 2013, she attended the Basic Level 2 training and then mid-February flew off to Los Angeles for the Zumba Fitness® Instructors Conference where she took Zumba Toning training (Zumba® with weights) and specialty classes of African, Hip Hop, and Flamenco. Armed with a month of new training, Lizy became a well rounded Zumba Fitness® Instructor. She honed her teaching one step further in 2013 with the best money she invested in her career, Pro Skills. 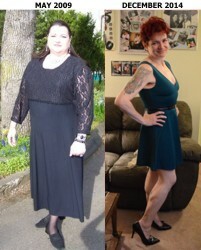 Amanda Grant inspired her through the program designed by Steve Boedt of Zumba Fitness® to be a better instructor and Lizy found her wings and began to fly. If there was ever a hesitation before, it was now done with confidence. The class now began with a cheer that got everyone ready to party and closed with a gracious thank you for the sweat and hard work the students put out on the dance floor. Infectious smiles, funny faces, eye winks and head wiggles became so commonplace that students thought that they were part of the choreography. Now 5 years into her journey to fitness and health, Lizy is down and amazing 100 lbs and dropped to a size 22 to a size 4/5! Her body has been built and sculpted by Zumba over the last 60 lbs and built a pair of the coveted legs in the Zumba community here in Victoria 🙂 In her classes you are sure to find her sneaking in plenty of fitness while you are having so much fun dancing you won’t know how great your body is being worked, you’ll just notice it changing! In May 2016 Lizy was diagnosed with Disk Degenerative Disease and has lost most of her L5-S1 disc. She began treatment at the myo Pain Clinic and has had to dramatically adapt and change her movement as she has learned about dealing with this. What has been the biggest challenge is not to jump. Hard to keep all of that *LIZY* all bottled up. An upcoming MRI and further specialists are going to give her the bigger picture and help her understand how to make permanent modifications so she can remain a Zumba instructor in good physical health. By day Lizy is a Senior Tech Support in the Customer Support Department for ParetoLogic. Whether you have an advanced need for your computer, a simple fix or a billing question, she is the friendly voice at the end of the phone and the one answering your email. With her husband, they own a small computer shop and she has had a small web-hosting company for the past 15 years offering free hosting to friends and some non-profit organizations. When there is time for web design, it’s her thing! Lizy is a mother of 4 young adults Ashley, Sarah, Lorgan and Nick, a mum to those that need one and a happy parrot and cat owner. Her beloved daughter Lexy lives on the mainland and has brought her two amazing grandchildren. She has been an inspiration to personal change in many people’s lives, a guiding light, a hand up, a kindred spirit, a karmicpower and a forever friend. A computer geek by nature, you usually find her fiddling around with someone’s website or hosting. Lizy’s alter ego is a chef, her favourite room in the house is her kitchen!